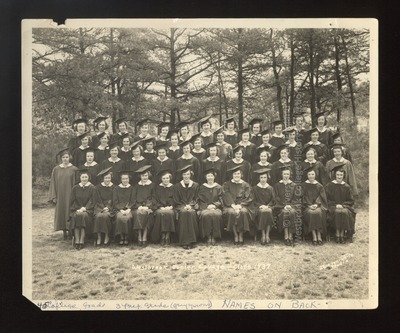 Forty-seven members of the Westbrook Junior College, Portland, Maine, Class of 1937 pose with Dean Elsbeth Melville in this black & white, outside, Commencement photograph by Jackson-White Studio. Written in blue ink on the front of the photo is: "45 College grads 3 prep. grads (grey gowns) NAMES ON BACK -". Written on the back of the photo in black ink is: "Back Row, Left to Right--Laura Pitcher, Barbara Veazie, Betty Sparrow, Roberta Rogers, Marion Kenny, Beryl Hawkes, Esther Stairman, Carol Tyler, Dorothy Peters, Spin Whitmore, Helen Brigham, Nancy Noyes. Third Row--Joy Moone, Ida Woodbury, Leah Pinkham, Dorothy Pratt, Eileen Stevens, Dorothy Kelley, Gwendolyn Weymouth, Selina Dunbar, Ruth Ardrey, Kay Blanchard, Kay Martin, Betty Stewart. Second Row--Elizabeth Hayes, Donna Wildes, Nancy Roberts, Mary Harvey, Marjorie Morrison, Margaret Smith, Barbara Martin, Theresa Johnson, Edythe Benson, Alma Armstrong, Mildred Haynes, Judith Warthen. Front Row--Martha Libby, Glenys Wing, Betty Soule, Florence Dunbar, Charlotte Vannah, Audrey White (President), Dean Melville, Marguerite Shaw (v. President), Dora Gould, Fran Merrimon, Marion Bardon, Carol Granger. Barbara Cole Missing from picture."